I am loving Western YAs. It's really fun to read these historical young adult novels set in a time that was simpler, yet still filled with the potential for adventure. Between highway robberies, pioneering and the gold rush, just to name a few, there is certainly a lot of material for writers to draw inspiration from. 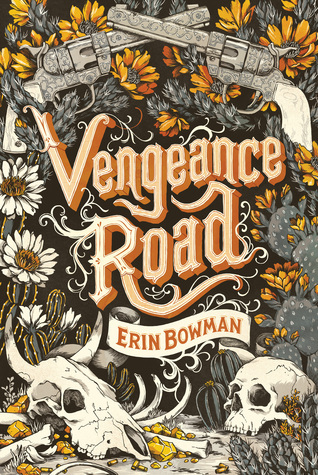 Vengeance Road, the latest standalone novel from author Erin Bowman, is the story of Kate Thompson, a girl hellbent on revenge and answers when it comes to her father's murder. Weaving in elements of gold rush lore and actual history, Bowman successfully crafts a compelling tale. I didn't always see eye to eye with Kate. Her sorrow and anger drove her to leave her home in pursuit of these Rose Riders. Her need for vengeance was her main pursuit, which often involved her making unlikable, reckless choices that endangers her lives and the lives of the people she encountered along the way. The desperation she felt at losing the only family she had, the only home she'd known was understandable. Kate might not have been likable at times, but somehow, she grew on me. Perhaps it was the loneliness she felt, or the independence she strove to have; perhaps it was her dogged determination, or her loyalty to the people she cared for. Whatever it was, by the end of the novel, I had come to care deeply for Kate. Kate's adventure involves hijinks and subterfuge, injury and death, horseback riding and camping under the stars; it also involves striking up relationships, friendly or otherwise, with other people - like Will and Jesse, Liluye, and Waylan Rose. Bowman maintains a clever balance between action and exposition, deftly switching back and forth in a way that kept the reader engaged and wondering what could possibly happen next. I was easily swept up in Kate's journey on the road to vengeance, and couldn't turn the pages fast enough. In spite of the abrupt beginning, clunky compared to what followed, I really liked this book. Bowman weaves fact into her fiction so well, shaping Kate's story in words that come alive off of the page. If you're interested in reading another western YA, look no further than Vengeance Road. I am loving the sound of this book. If you would have say I would be excited about a Western book I probably would have laughed, but this story sounds really appealing :) I think I will adore Kate! I am really hoping this western micro-trend lasts for a good while. I agree with you about this book being totally vivid and evocative. It was a lot of fun and one I'm really happy I had a chance to pick up (even with the clunky ending which I also agree with you about). Great review! Glad you enjoyed this one, Alexa! I was pretty enthralled from beginning to end. I loved being inside Kate's head - she was so feisty and fierce! I liked her loyalty too. I hope Erin writes a couple of companion books in this world! The best part is that her name is Kate!! hahaha! Seriously, though, I am really looking forward to reading this one. I like the Western trend, as well! This was such a badass book. It's rare to see girls with guns in YA and see them be unremorseful to killings, which is awesome. It is a revenge book, after all.